Spring Break 2017 was approaching, and I was looking forward to taking my kindergartener on a road trip exploring more of California. Death Valley National Park is a place I’ve been dying to visit (haha), and the week off would be the perfect time for Bethany and me to check it out. The weather forecast for the area called for comfortable temperatures and sunny skies, so I convinced my little five-year-old to tag along with me. 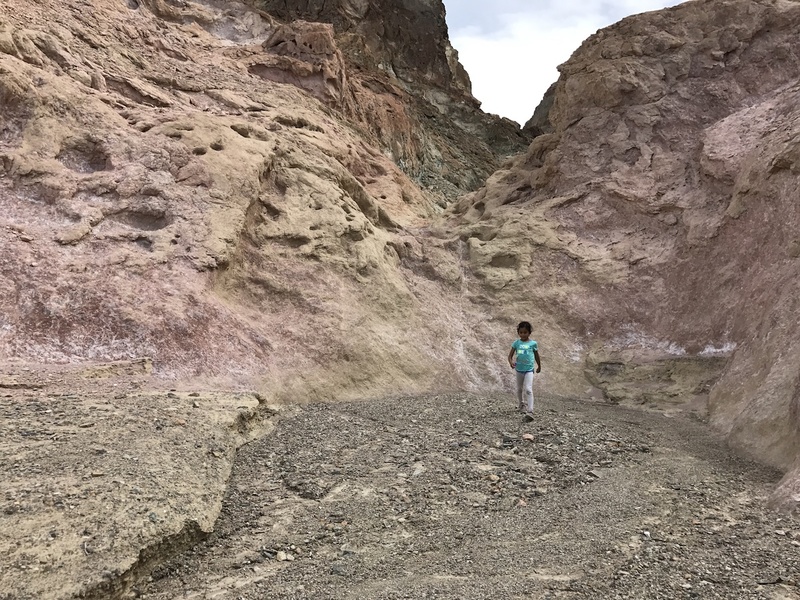 I was interested in child-friendly hikes that weren’t spaced too far apart from each other—Death Valley is HUGE—which would provide us more time for exploration. 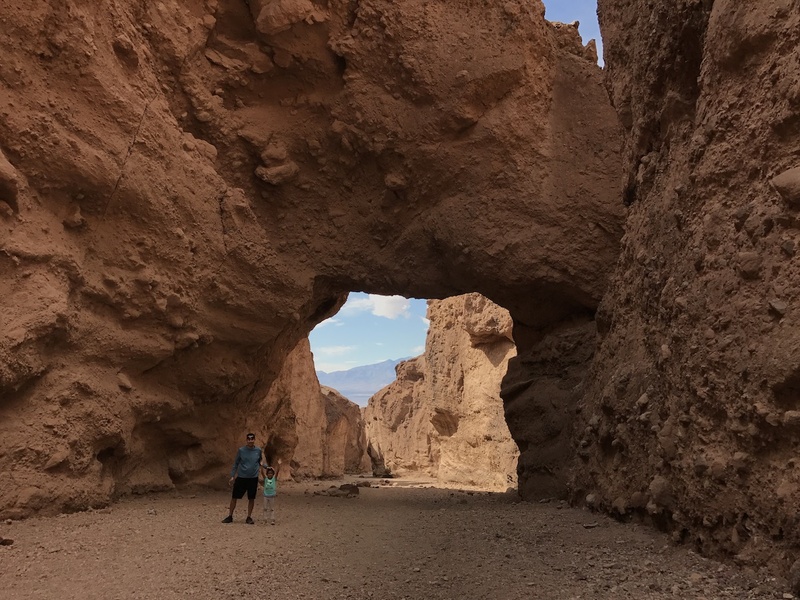 Based on recommendations from friends, information from a few guidebooks, and the National Park Service website, we settled on five locations to explore: Badwater Basin, Natural Bridge, Devils Golf Course, Artist’s Palette, and Mosaic Canyon. They were all within a 60-mile drive of each other, and were considered sites we shouldn’t miss. 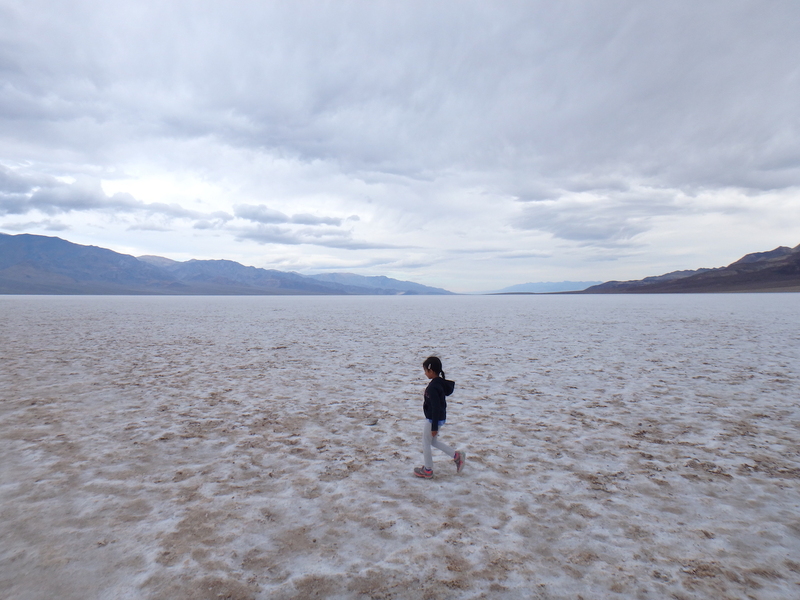 Badwater Basin lies 282 feet below sea level—the lowest point in North America—and was first on our list to visit because we wanted to avoid the bright midday sun. 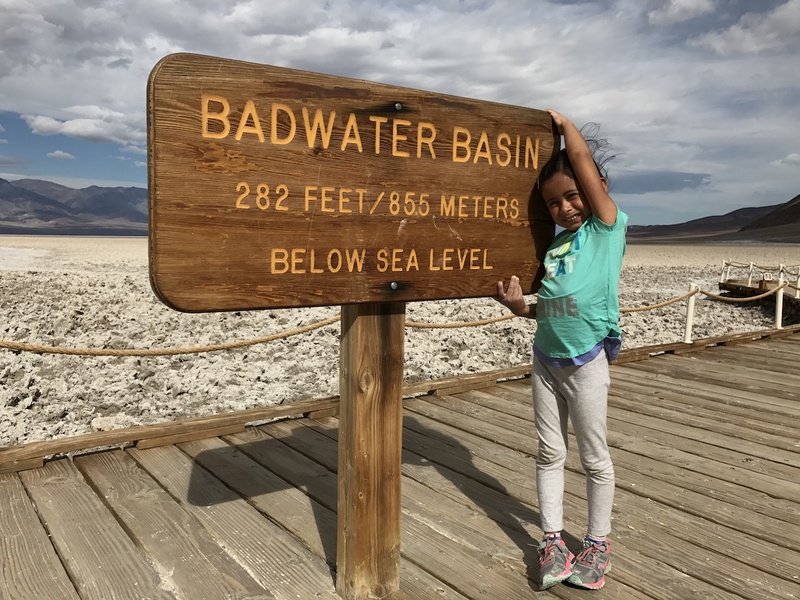 After walking out onto the boardwalk, we stood next to the “Badwater Basin” sign and turned to face the cliffs behind us. Up on the cliff side, a large sign that read “SEA LEVEL” provided a perspective of how incredibly high (or how deep a body of water) 280+ feet really is! A short walk beyond the boardwalk took us to the vast salt flats that seemingly stretched out for miles, with an awesome view of snow-capped mountains in the distance. Bethany attempted to build a “snowman”, and because the salt wouldn’t hold its form in midair, our “snowball” fights resembled two kids in a playground throwing sand at each other! 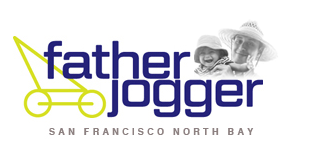 Next up was the Natural Bridge Trail. We bounced around on the slow 10-minute dirt road drive leading to the trailhead, and hiked to the “natural bridge”. 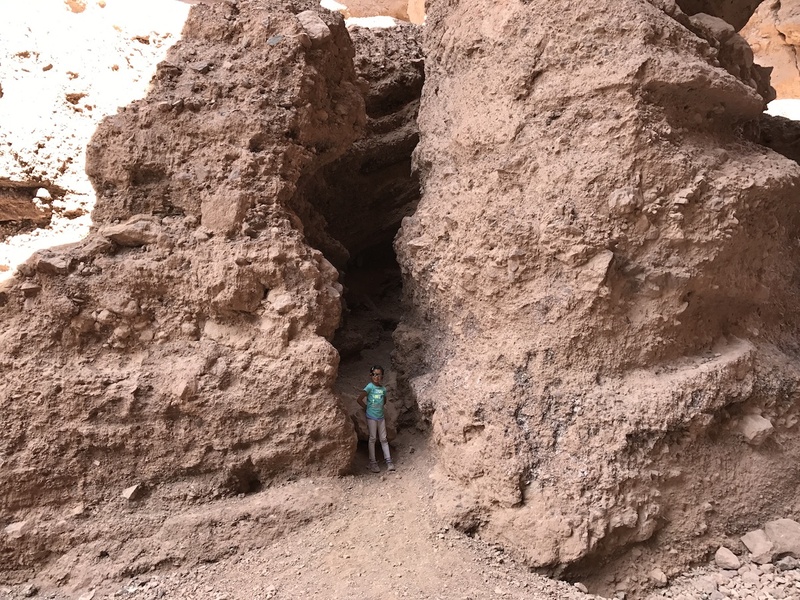 This wide, canyon-enclosed trail has a steady incline leading to the arch, and Bethany handled it well. 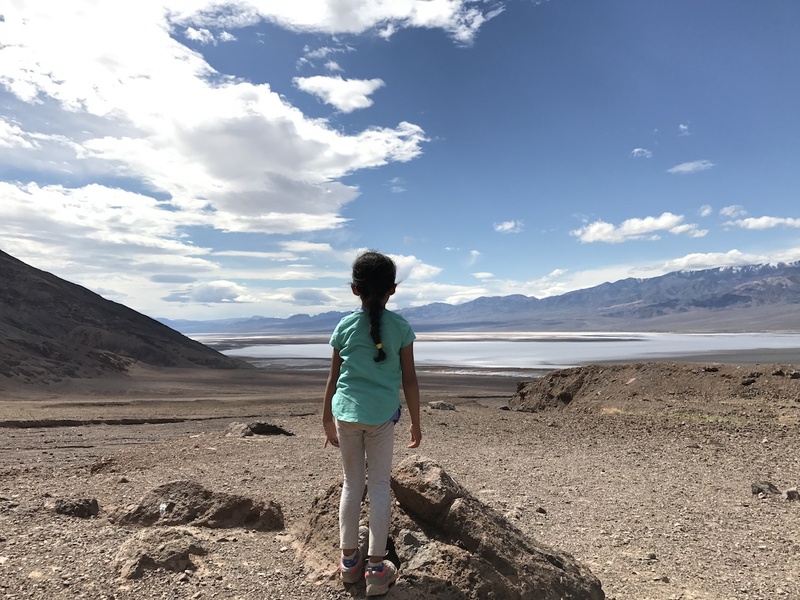 We spent a few minutes admiring and discussing basic geologic features created through the processes of erosion, and on the hike back to the trailhead enjoyed a view of the salt flat basin in the distance. Trying to hide from Daddy along the Natural Bridge Trail. 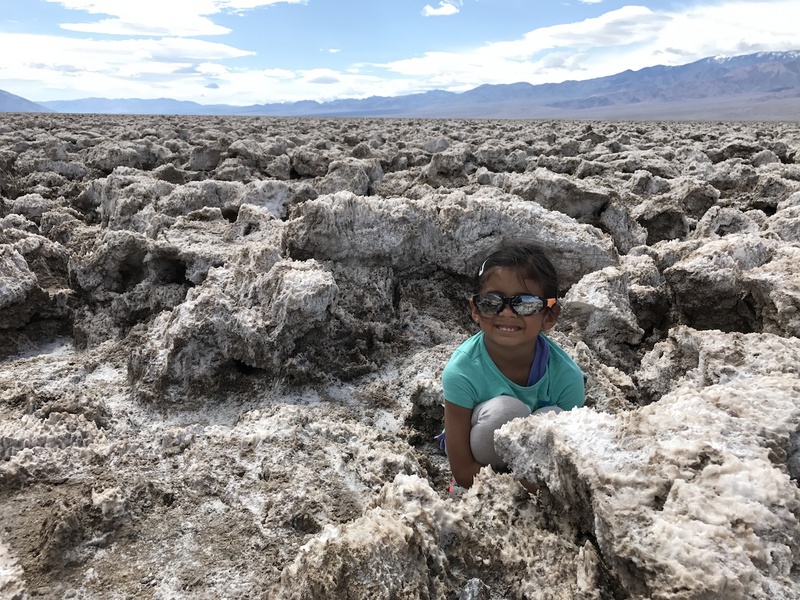 Bethany had been looking forward to visiting Devils Golf Course. 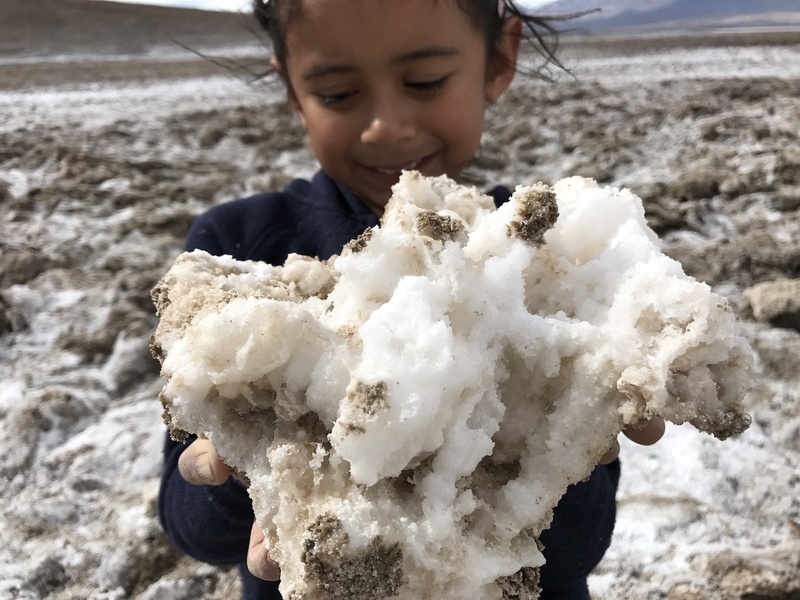 In the days leading up to this trip, I had warned her of the salt formations here—they were rock-hard and sharp—and if she didn’t explore carefully, she could end up with scrapes, bruises, or broken bones. 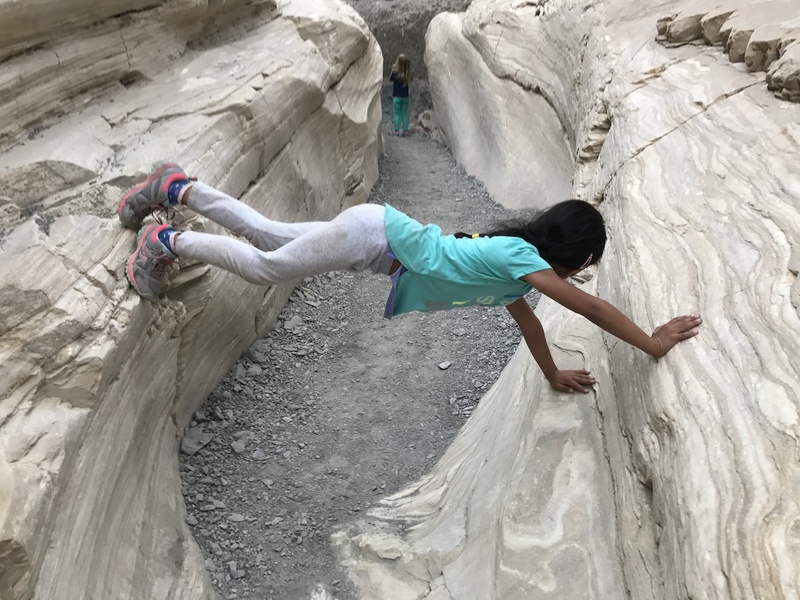 This only fueled her determination to prove that she would be able to handle the terrain, and after additional warnings from the information posted at the parking area, we proceeded onto the ragged landscape. 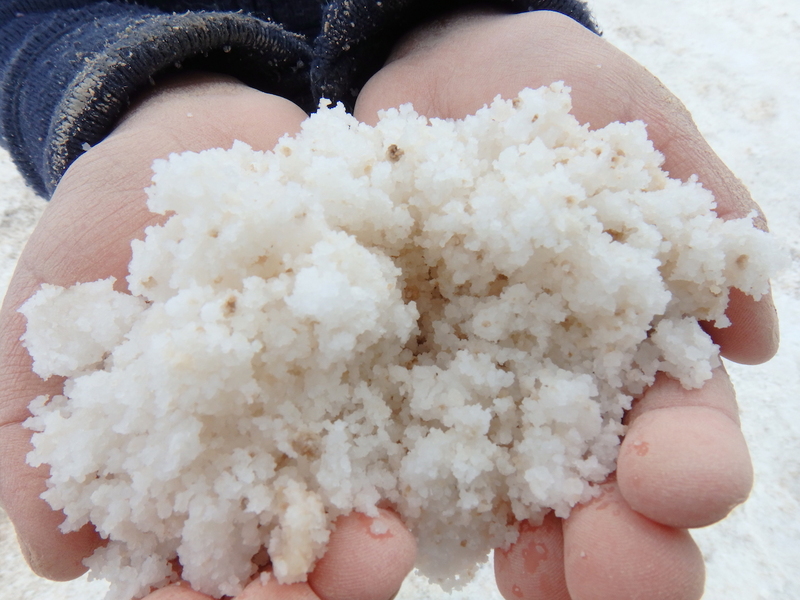 After walking through the salt formations, some of which were two feet high with sharp edges, we realized they are indeed potentially dangerous! Bethany’s shoes had good grip, and she was careful to avoid any slips and falls. Devils Golf Course, with its ragged salt formations. 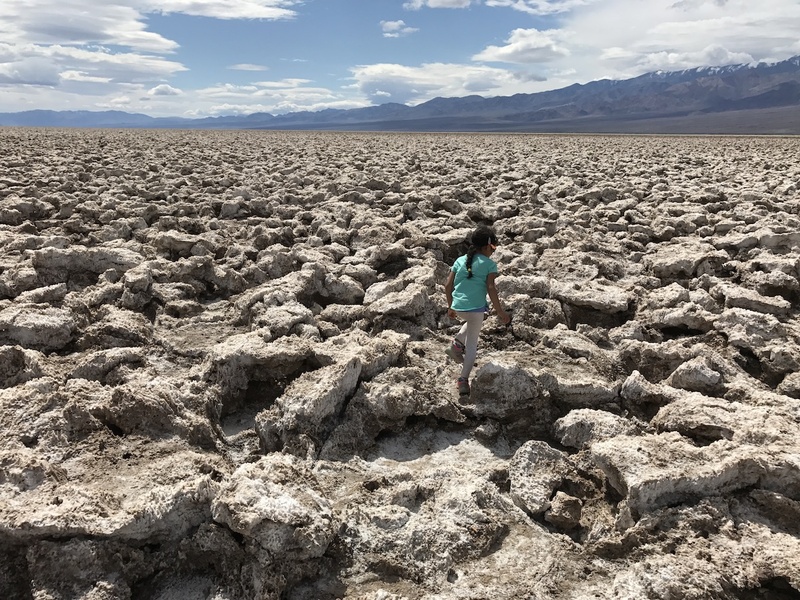 Careful exploration at Devils Golf Course is a must. After Devils Golf Course, we headed to Artist’s Drive, a paved, one-way road through some colorful hills. Shades of blue, red, orange, and yellow against the mostly tan and brownish hillsides resembled an artist’s palette, and the destination on this leg of our journey is accordingly named “Artist’s Palette”. We pulled into the parking area and hopped out for a better view, with the scene before us definitely a spectacular sight to appreciate. Colorful hillsides at Artist’s Palette. 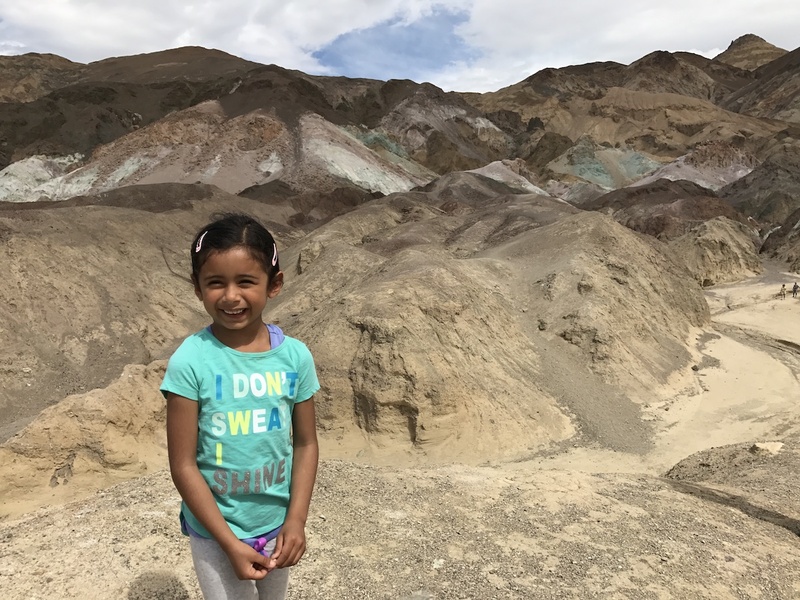 Our last stop at Death Valley was Bethany’s favorite: Mosaic Canyon. Despite another bumpy dirt road drive to the trailhead, it was worth the visit! 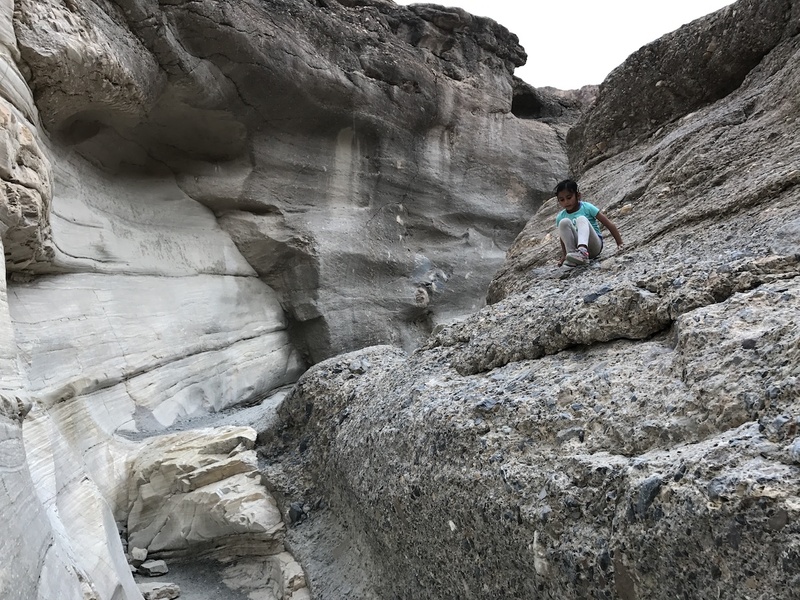 A few minutes into the trail, we entered a narrow slot canyon with walls of smooth marble and rough breccia, and Bethany enjoyed her exploration around the rocks. 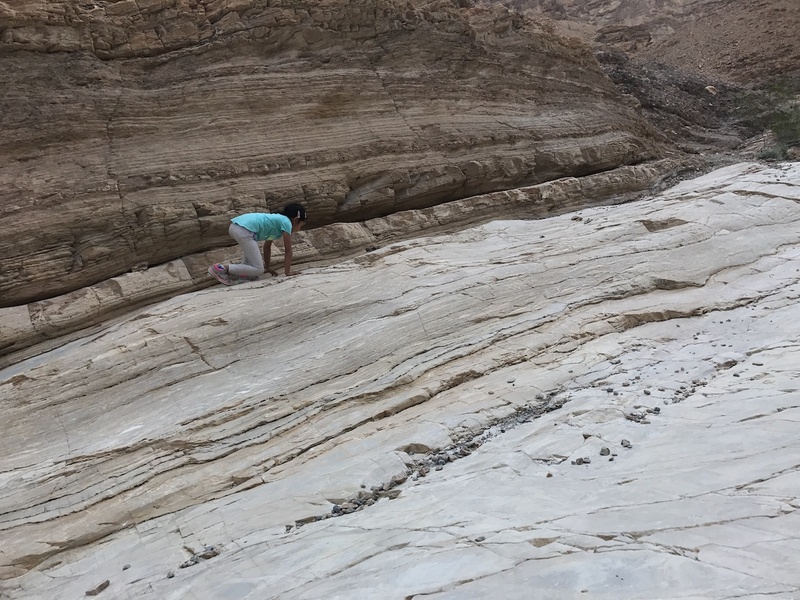 She was careful not to slip on some of the smoother marble surfaces, and I held my breath a few times during some of her short but daring climbs! 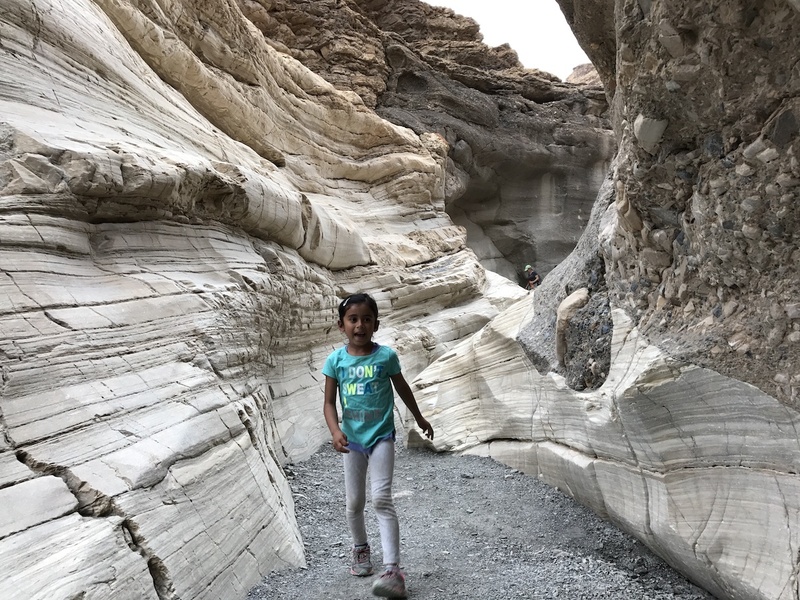 Mosaic Canyon Trail, with its smooth marble and rough breccia walls. On our drive away from the park, I safely pulled over for a picture of the valley before us. The view impressed us, and we both agreed the day at Death Valley was a good one. 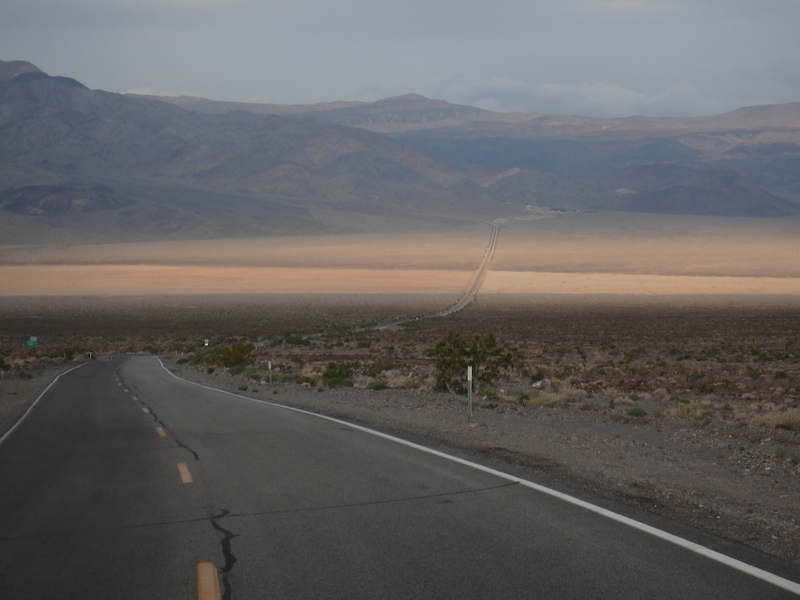 Heading toward’s Death Valley’s exit. Note: Before arriving at Death Valley, we were sure to pack plenty of snacks, water, and sandwiches for lunch. Food is available in the park, but we thought it would be more fun to eat with a view of the unique landscape. You do all the fun stuff!